Home » FasTracKids Blog » Posts » FasTracKids Sets Sail with Live Interactive Curriculum Partner sitesALIVE! American skipper and sitesALIVE! 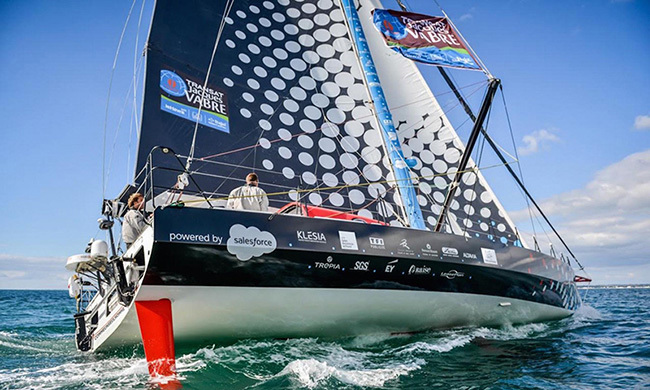 founder Rich Wilson will set sail in the Vendée Globe 2016: a solo, non-stop, around-the-world sailing race, departing from Les Sables d’Olonne, France. Known as the “Everest of the seas”, only 71 people have completed the race, compared to the 500+ that have successfully reached the summit of Mt. Everest. Rich’s motivation in participating in such an extraordinary challenge is to excite and engage students in learning by connecting them to live, global, real-world adventures. Through this partnership, FasTracKids centers and schools can offer a unique live interactive educational experience. Students will be able to communicate with Skipper Rich and his team of experts via e-mail and videos, answering questions and providing interesting facts during his journey. FasTracKids will integrate curriculum topics such as goal setting, geography, oceanography and other subject matter in the classroom as Rich travels around the world. About sitesALIVE! – SitesALIVE!’s mission is to excite and engage students in learning, for science, geography, math, and history, by connecting them to live, real-world adventures, expeditions, and field research stations globally, and to the people at those sites, on land or sea, using print and online distribution of curricular-based classroom activities which are informed by scheduled deliverables from, and interaction with, the adventures, expeditions and field research stations. For more information, visit www.sitesalive.com. About FasTracKids International – Founded in 1998, FasTracKids is a proven innovator in early childhood education worldwide. Using programs designed for children 6 months to 8 years old, FasTracKids provides an international educational advantage by encouraging children to discover a love of learning in a fun and interactive setting. FasTracKids utilizes revolutionary technology to reinforce a child’s communication, creativity, confidence, critical thinking and collaboration skills that will carry over into the home and school settings. FasTracKids International headquarters is located in Greenwood Village, Colorado, USA. For more information, visit www.fastrackids.com.